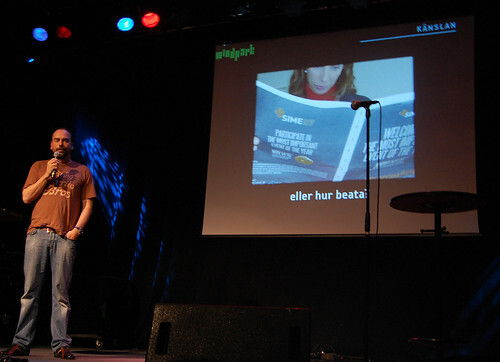 Joakim Jardenberg of Mindpark says that papers are dying. All trends show that. The last paper will be publised in April 2040 according to Philip Meyer. In Helsingborg newspaper reading has gone from 90 to 60 percent in only a few years. We compensate by creating new channels, such as the website and free papers. – We have expanded our reach at HD. The way we connect to people is not important. The important thing is that we keep on delivering eyeballs to our advertisers. We still idealize paper publishing. 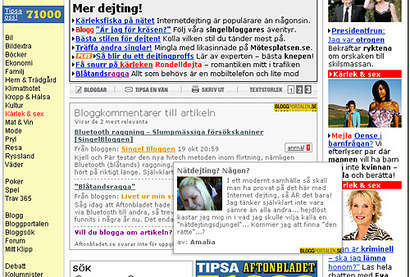 Joakim turned to me to give the example of Aftonbladet’s blog service, where the key point is that you can be published in the paper (well, one of the benefits, I’d say having your blog post appear at aftonbladet.se’s main page is just as appealing). Another example is that Beata Wickbom is very happy about the Sime supplement in SvD (the above image). The day we can utilize our journalists and have them collaborate with their audience we can use their competence much better, Jardenberg says. – The old and new worlds are at war. Get over it! 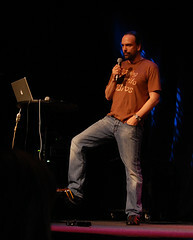 Check out Jocke’s slides from Daytona Sessions here. It is of course too early to write a review, other than that it’s a good thing that SVT has understood that they can’t dictate the viewers’ options, but need a more open attitude. Most importantly, SVT needs to understand that they can’t have a YouTube channel that works as a branch of the press department, with trailers of upcoming shows only. There is a need for an active editor: someone who can find the gems in the daily production and publish them. If they don’t do that, the viewers will do it themselves, and then the point of the channel is lost for SVT. I’m inclined to agree. This first effort is a start, but it doesn’t take them a very long way. Yet I can’t even imagine how this step is perceived in the concrete bunker in which the SVT is housed. To many people there I’m sure it’s a revolution, and I suspect they are not all happy about it. Old organizations are usually not the fastest movers. 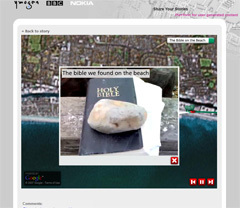 In December I wrote about the multimedia project in Brighton which is a collaboration between the University of Brighton, Nokia, Ymogen and the BBC. 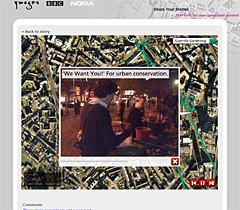 Today the result was released as Geo-stories, a set of geo-tagged photos and film clips brought together as a kind of multimedia story on this site. If the goal was to ”create engaging stories” as Mark Hardwick put it, I’m sorry to say I am not that impressed. There are two ways to explore the stories, either by clicking the ”play the story” button, in which case you get the full multimedia experience with a satellite image background, music and text, photos and video clips telling a step-by-step story. Unfortunately many of them are over-done, having music with lyrics in the background while you’re supposed to read small and quite blurred text which disappears too quickly. The most engaging story is The bible on the beach, though that one raises a lot of other questions. Nowhere do we get to know if this is a fictional or true story. If it’s true, there are a lot of objections to be made. If not, that should be made clear. The Guerilla gardening story also works okay. The other way of exploring the stories is by clicking the dots/signs on each story’s map. That doesn’t work well at all. The navigation leaves a lot to be asked for. It sometimes, for instance on the ”Tree Survey”, brings you away from the map of photos/video clips once you click to view one of them. In other places you still get to see the map with the geotagged photos, but if you’ve zoomed in you lose the zoom once you click on a photo and have to re-zoom (and re-zoom you have to, since the standard view of the map is so much zoomed out that the photo dots are on top of eachother). If you use the Next and Previous links there are no indications on the map which dot represent the photo your looking at. However, it is an interesting experiment, and a first step towards using geotagging in story-telling. The main flaws in the second way of story exploration are actually due to less than perfect site building, not the way the students have carried out the projects. With some more training, this could mature into something quite interesting. But it is important to remember that a web audience usually wants to be active – clicking the forward arrows in the multimedia needs to work flawlessly. And clicking your way around a map needs to work without the map reloading and zooming when you haven’t asked it to. As for the ”citizen media” aspect, I see no way to contribute to the site, though it says you can comment as a registered user. That doesn’t seem to include the general public, or the link is well hidden. But I guess the citizen journalism part is referring to the students not being trained journalists.